Statistics can't capture the human impact of credit card debt, but it is important that statistics represent as closely as possible how the burden of credit card debt weighs upon family finances. 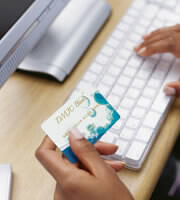 For this reason, IndexCreditCards.com is now taking a new approach to calculating average credit card debt. So it appears that U.S. average credit card debt is headed down. That's undoubtedly a good thing. But does it tell the whole story? The above calculation doesn't take into account that not all families have credit cards. The Federal Reserve's Survey of Consumer Finances, a study which is released every three years, tells us that only 73 percent of households have credit cards. Households without credit cards don't have any credit card debt. Taking that into account, the households with credit cards would carry an average credit card debt of $9,577 per household, not $6,991. But wait! Some of those households pay off their credit cards each month, and so they don't carry credit card debt either. The SCF goes on to say that only 46.1 percent of households actually carry debt. So to really get an idea of what's going on, we need to distribute the total credit card debt among just the households that owe this debt, then the average debt burden jumps to $15,166 per household. Not $6,991, not $9,577, but $15,166, is what it's really like for the average family who has credit card debt these days. Whether or not that $15,166 in credit card debt represents a problem for an American family depends a great deal on that family's income. Credit card debt is not evenly distributed across all income tiers, of course, since people who earn more are likely to owe more. But what really matters is how large that debt is relative to household income. Unfortunately, it is the poorest families who typically end up with debt that is out of proportion with their incomes. Using this approach, IndexCreditCards found that households in the lowest income bracket had the highest ratio of credit card debt to income. As of the end of 2011, their median credit card debt outstanding represented 16.9 percent of household income. The level of credit card debt as a percentage of income goes down steadily as income levels rise, even though the dollar amount of debt increases. For families with incomes in the top 10 percent, the typical credit card debt represents just 7.5 percent of household income. The good news is that families with the highest credit card debt as percent of income have seen the most improvement in the last couple of years. The current 16.9 percent credit card debt burden among low income households is down from a peak of 20.7 percent that was reached in mid-2008. While this represents an improvement of 3.8 percentage points in debt burden, at the top income tier the improvement over the same time period was just 1.5 percentage points. 0 Responses to "Average credit card debt: It's bigger than you think"